I know I’m not the only person who believes Chrissy Teigen is their spirit animal. I love what she’s all about – she’s honest, unfiltered, herself – traits I hope to own up to…one of these days. When she came out with her Cravings cookbook a lot of people were saying that they had no idea she was such a foodie or that she enjoyed cooking. Well…move aside people, I won’t call it bragging but I was entirely aware of her WordPress blog from the time I knew she existed. Once I caught whiff that she would be releasing Cravings I was beyond excited. Since I received it as a surprise present it’s a cookbook I turn to for fairly simple but wonderfully delicious recipes. It was the book I turned to when I hosted Friendsgiving in November. It’s the cookbook I have a goal of making each and every single recipe from this year. It’s pretty hard moving on to new recipes when I’ve found recipes that I try again and again. 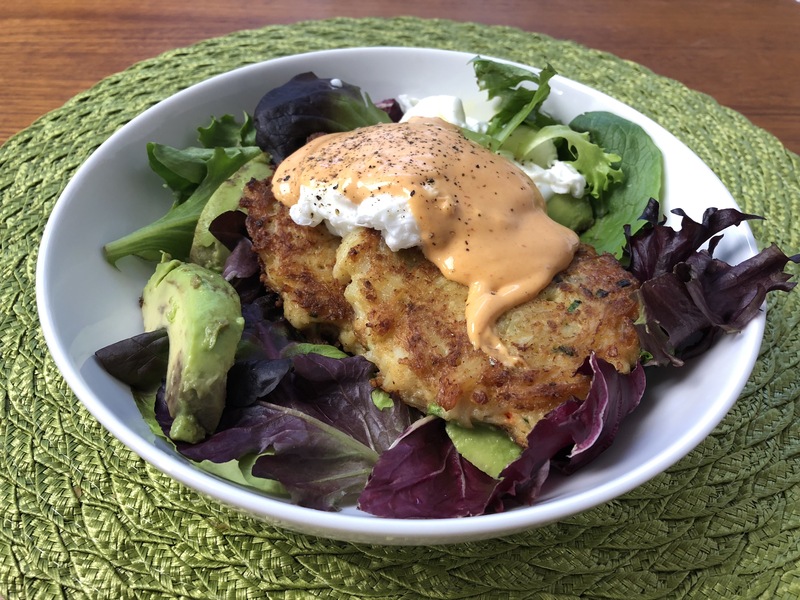 This morning (and I guess part of last night) I decided to FINALLY make her Crab Cakes Benedict with Avocado. My God, I love crab cakes bennies. Any time I’m back home in the Bay one of my foodie requests is to pleasepleaseplease visit Bill’s Cafe (my favorite location is in Willow Glen) so I can get a mouthful of my fave menu item. I’ve had Cravings for about two years now and it’s unusual that I haven’t yet tried the recipe. Gather all ingredients and whisk together in a bowl (doesn’t need to be a humongo one) then cover with plastic wrap and place in the refrigerator until ready to use. place all ingredients in mixing bowl and fold with spatula. don’t try to break apart the crab meat; form into four patties on place; cover then refrigerate for 1 hour (I did half an hour because I was in a pinch); pour oil into skillet and fry that ish ’til golden brown on each side. The recipe says it’s four minutes per side but I fried til it was a certain color – whatever floats your boat. Once cooked, place on paper towel to drain oil then place two patties on each salad bowl. I cheated a little here. Well not really – it’s just myself and my roommate eating this and it’s meant for four people…or so it says. We were hungry. Don’t judge. simmer water in a small pot; crack eggs and slip each into a small cup (I used reused a ramekin to make my life easier + I was lazy); once water is simmering add vinegar; slide egg (and cook one at a time) take off heat for 3-4 minutes; scoop egg out CAREFULLY with a slotted spoon; let the water drip off then place onto crab cakes. scoop a good amount of the fake hollandaise sauce over the eggs and sprinkle a little black pepper. Oo la la – I just made bennies! Hopefully I won’t get in trouble for having the recipe listed out here. Seriously, please, don’t sue me. I’m a struggling soon-to-be floral designer. the poached eggs were a semi-fail but they turned out okay! the roommate helped me in that department and by the third egg it was looking better. maybe I need to follow a different poached egg recipe? Anyone out there a G at cooking them? ?